KW offers you the opportunity utilize the OEM factory interior damper controls of your sports car to control the KW DDC Plug & Play coilovers. Applications are available for various german models and now the new Focus RS Mk3. The best part is, except for the replacement of the adaptive factory OEM suspension with the KW DDC Plug & Play coilovers, there are no further conversion steps or even modifications of the stock wiring. The KW DDC Plug & Play coilover simply plug into the factory plugs for the adaptive suspension. The user is able to select the different settings with their factory interior controls of their vehicle. KWs suspension technology is compatible with the electronics of various automobile manufacturers including Ford. The adaptive KW DDC Plug & Play coilover kit is recognized by the factory onboard electronics. All displays and control elements of your vehicle remain fully functional with the advantages of adaptive damping. The stainless steel construction provides additional protection and durability against the elements, salt and dirt. Height adjustability is retained from our unique use of materials for construction. 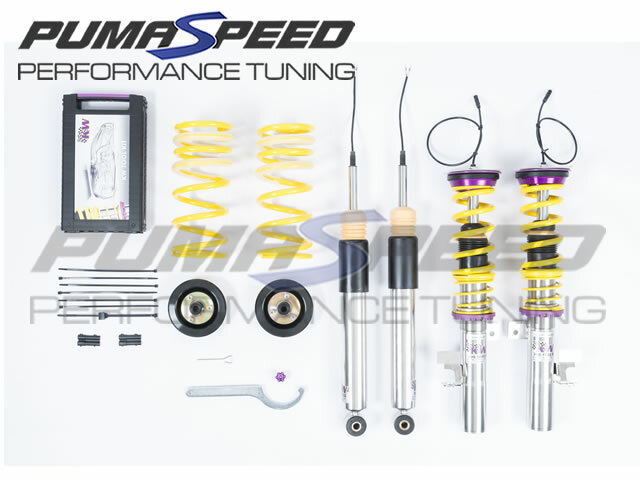 Transform the handling of the Focus RS Mk3 with this suspension system by KW Automotive. The Pumaspeed Workshop team are ready to fit the KW DDC Plug & Play Coilovers - Focus RS Mk3 in our Head Office located here. Therefore making parts and labour a total cost £2,714.00 (inc. VAT). Pumaspeed have a specialist distribution team that can dispatch the KW DDC Plug & Play Coilovers - Focus RS Mk3 to any destination worldwide.